Peanut butter cookies stuffed with chocolate peanut butter cups! You are going to love these Peanut Butter Cup Cookies . These Peanut Butter Cup Cookies are a favorite of mine. I mean a cookie stuffed with candy, how could these not be a favorite. Peanut butter cookies have a special place in my heart. They are the very first recipe my mom taught me, and the first cookie I ever made on my own. I think it’s what sparked my loved for cookies! Well I took my peanut butter cookies to the next level with this recipe. 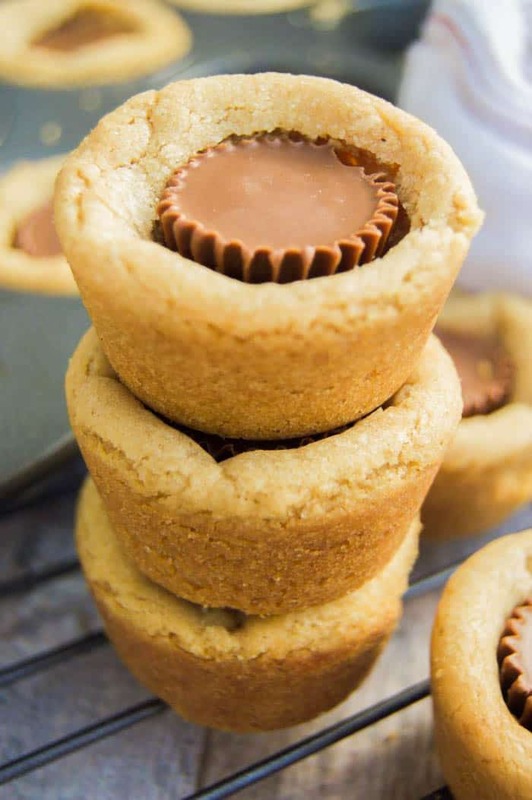 My favorite classic peanut butter cookie recipe, but I baked them in a mini muffin tin and then stuffed them with chocolate peanut butter cups! Oh yum!! Beat your peanut butter, butter, brown sugar, sugar, egg, and vanilla extract until fluffy. 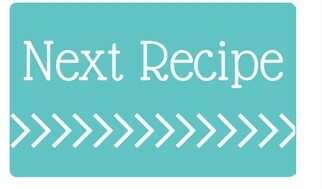 In a separate bowl combine, flour, baking soda, and salt and then slowly add it to the peanut butter mixture. Place a spoon size scoop in your dough into a mini muffin pan. While your cookies bake unwrap your peanut butter cups. 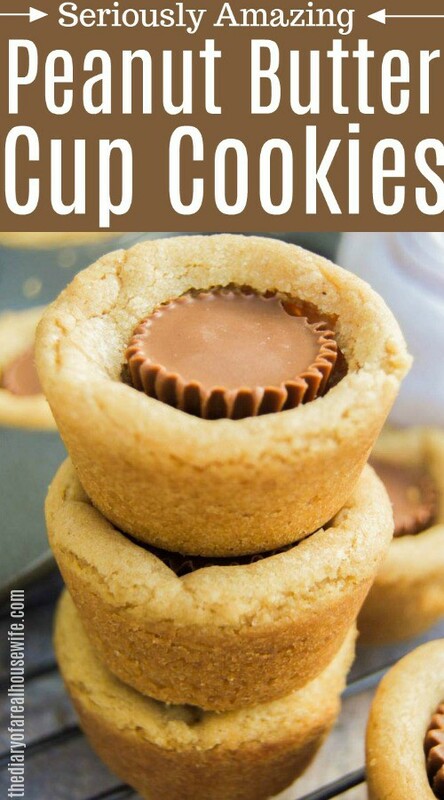 When your cookies are done place your peanut butter cups into the center of the cookie right away. Place on a cooling rack and let cool for 3-5 minutes or until your peanut butter cups have become hard again. Chocolate Chip Peanut Butter Cup Cookie: One of my favorite cookies! The classic chocolate chip cookie with diced up pieces of peanut butter cups! Peanut Butter Cup Cookie Dough: No baking just eating! This cookie dough can be eaten right after mixing. In a separate bowl combine, flour, baking soda, and salt and then slowly add it to the peanut butter mixture. Mix together until well blended. Bake for about 8-9 minutes or until golden brown. While your cookies bake unwrap your peanut butter cups. 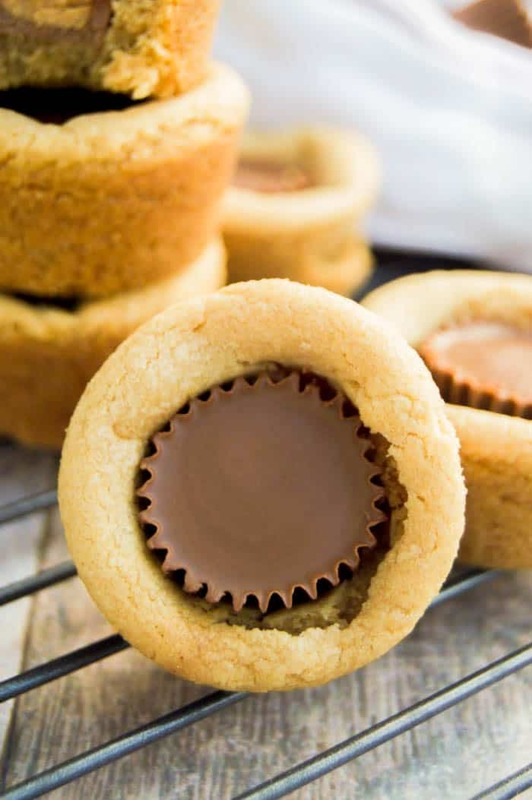 When your cookies are done place your peanut butter cups into the center of the cookie right away. Place on a cooling rack and let cool for 3-5 minutes or until your peanut butter cups have become hard again. Ohh, these are absolutely my favorite cookies in the world! My aunt and I call them “Peanut Butter Temptations” because we are always tempted to eat the whole batch! these look amazing! Anything with chocolate and peanut butter is a friend of mine! The only thing is I don’t have a mini cupcake tin. Any other way to do it? These look so yummy! My favorite cookie combination is peanut butter and chocolate. Thank you for sharing!